Anderson, Don (2017). 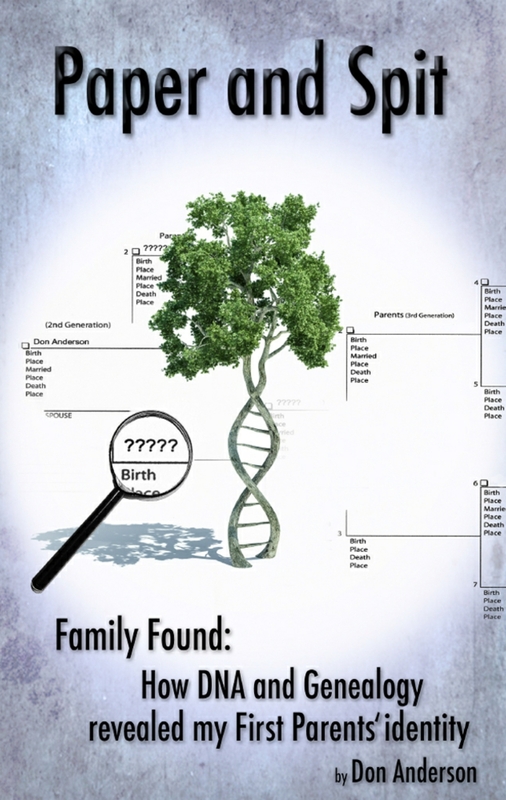 Paper and Spit: Family found: How DNA and Genealogy revealed my first parents' identity. Published by CreateSpace Independent Publishing Platform. ISBN 9781544606989. From the publisher's book description: "Using DNA and genealogy, Anderson finds not only the identity of his birth parents but also his true ethnic heritage." Paper and Spit chronicles an adoptee's search for birth family, from the traditional paper search and reunion with his birth mother to the modern DNA search for his birth father and ultimate closure. The author's enthusiasm and dedication to the task, which involved a huge learning curve and effort gathering evidence, are apparent on every page. He was blessed with many helpers and welcoming family members along the way. May the book set examples for those searching and those found and those able to help people with unknown parentage to find answers and healing. The book is reasonably light on technical detail and I do not view it as a how to guide, rather as one searcher's personal experiences.